"Like Us" on Facebook and leave a comment to enter in our Contest to WIN fabric. Here are some pics from the ‘Schoolhouse’ that some of the designers did at Quilt Market in Houston this past weekend. It was called Design Diva’s. Check out some of the Henry Glass Designers who participated below. 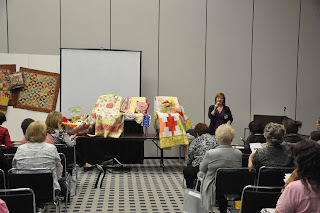 For more pics from Quilt Market see our Henry Glass Fabrics Facebook Page. 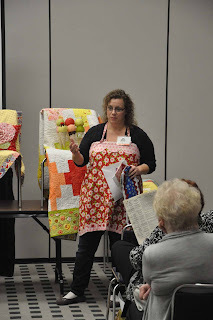 The Hampton Farm line of fabric arrived at Little Quilts a few weeks ago. It was even more beautiful than they remembered when designing it. They love the classic reproduction look that combine the larger floral with coordinating smaller prints. The mini stripe is so versatile too. The customers at Little Quilts love the small stripe for sashings and bindings. These patterns are available to download. 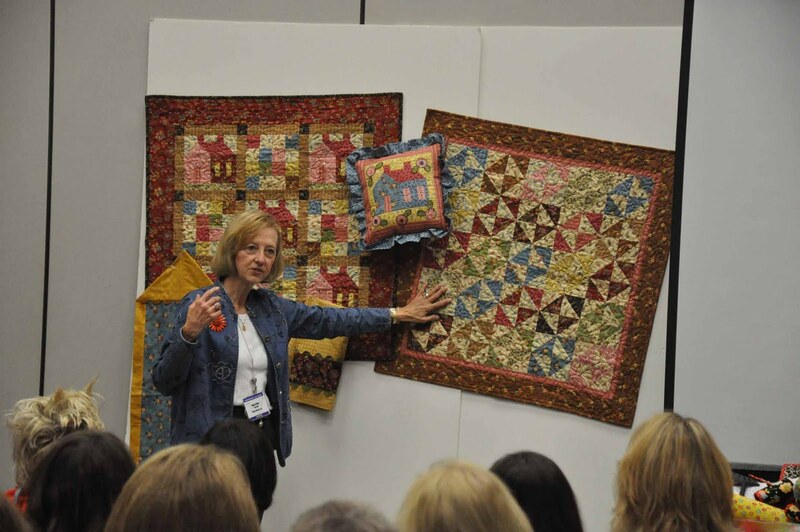 Sylvia loves traditional designs so she made this Triangle Quilt. Alice loves House blocks and the fabrics leant themselves perfectly to make a house pillow to go with the Hampton Farm House quilt. The Ten Minute Table runner is one of the most popular patterns in the shop. They make perfect hostess and teacher gifts. Homespun towels are fast and easy to make with fabric trim and jumbo ric rac. 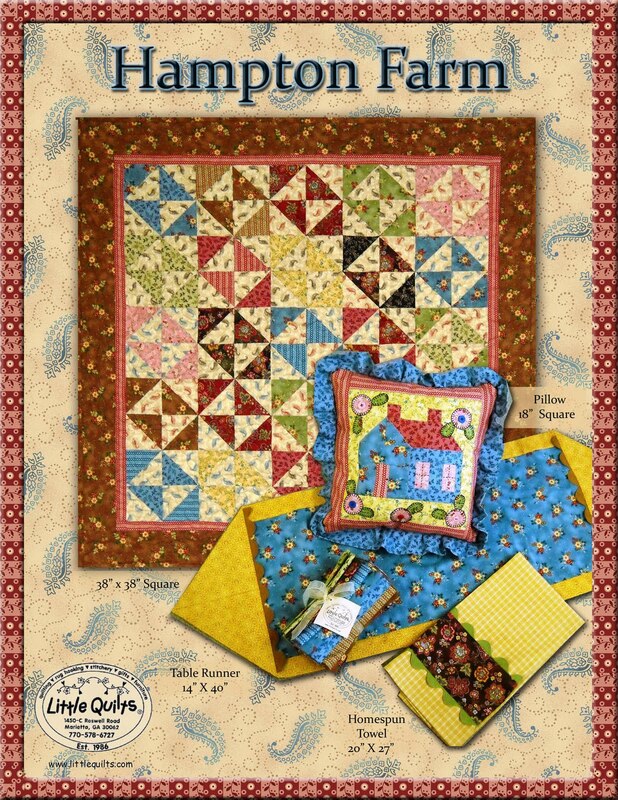 Check out the Little Quilts website for kits for the towels and Hampton Farm House Quilt kits. 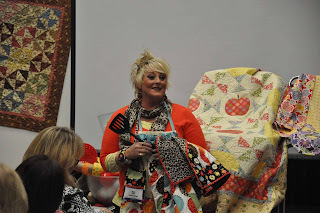 HG Designer Anni Downs Blogs for US! 'My Favourite Things Sewing Basket & Accessories'. The basket has pockets and is stiffened in the top edge with rigilene (boning) to retain its shape. The pattern also includes an easy-to-make needle case, scissor keep & scissor decoration, and a pincushion, all of which can be hooked over the basket buttons for easy-to-find storage. I thought a doorstop would be a perfect accessory in a girls bedroom and was quite easy to put together with just a small amount of applique. Again I just HAD to fussy cut the flower fabric - FUN! This pattern is called 'Welcome Home Doorstop'. I made 'Laura's Quilt' to represent the whimsical life of girls (finished size 45 3/4"x53 1/2"). I again fussy-cut the image print and made them into ovals and finished off the quilt with a cute scallop around the edge. 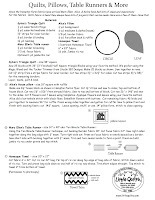 This pattern also includes 3 stitcheries if you would like to use these as an alternative to the image fabric. The image fabric is perfect for fussy-cut hexagons, so I just HAD to make this 'Tea Party Table runner'. 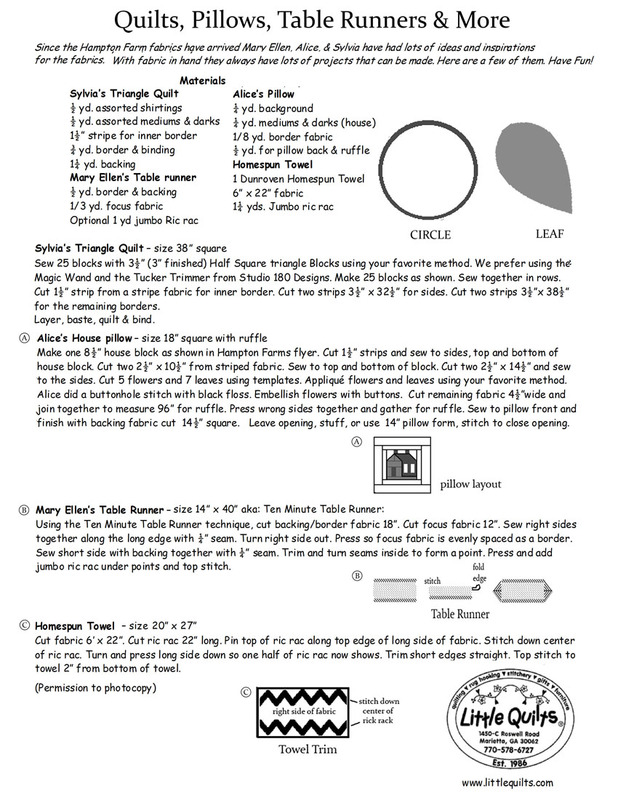 There are very detailed instructions to make both the table runner and the coasters and also included in the pattern are some stitchery designs for the hexagon centres if you prefer. 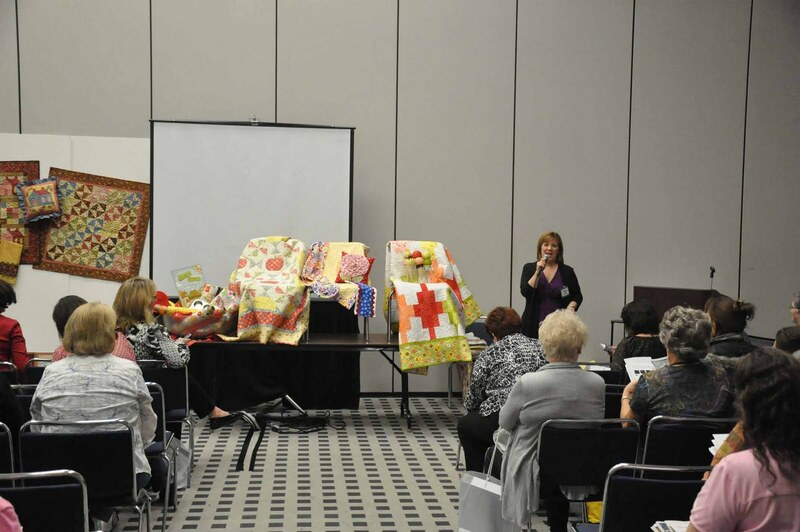 Little Quilts loves working with all the fabrics from the many great designers at Henry Glass. 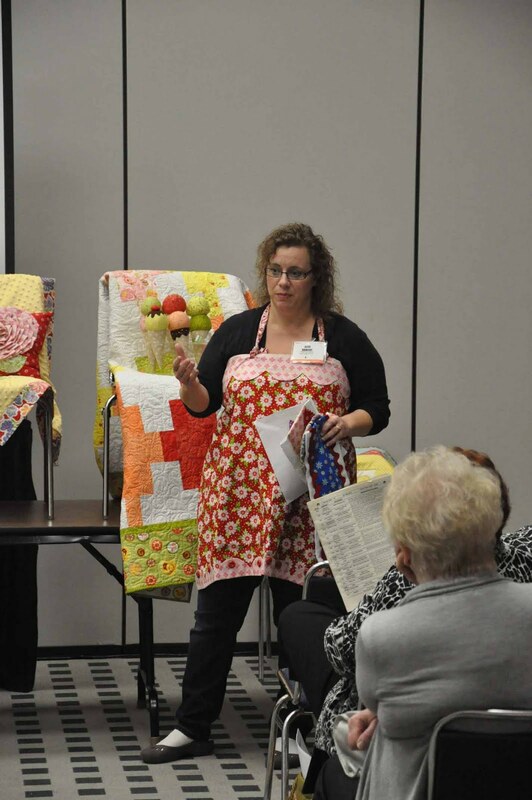 Here are two kits using the panels which make wonderful quick and easy quilts. 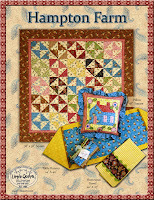 They have put together a kit using the panel for the center from Buggy Barn’s Pumpkin Pie line. With simple piecing for the borders you have a quick, easy wall hanging for fall, 31” x 44”. The kit includes everything but the batting for $34.95. Little Quilts also has a kit for a sweet baby quilt using Woodland Friends designed by Debi Hron. The center is the panel with the charming owls, and other critters. We cut simple squares and joined them together for the side borders. The top and bottom borders are just strips of the stripe fabric. So quick and easy! 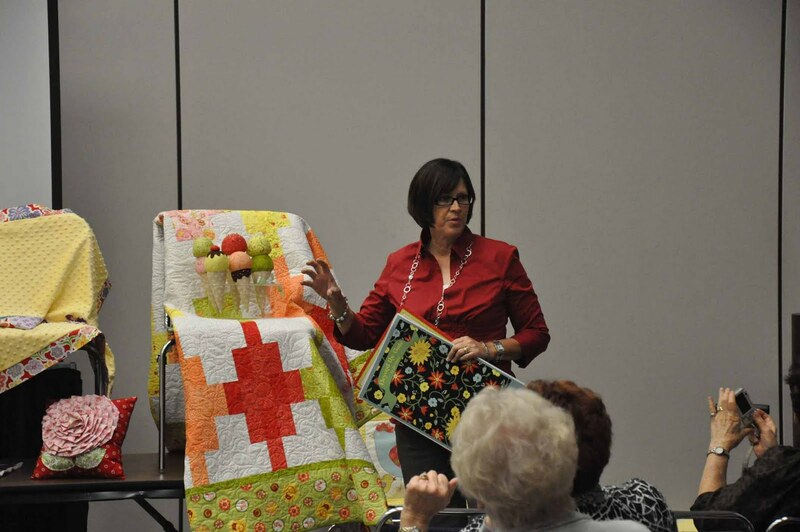 Any little one would love snuggling with this quilt. 39” x 48” for $19.95. You will need binding and backing. Visit their website http://www.littlequilts.com/ or phone 770-578-6727 to order.